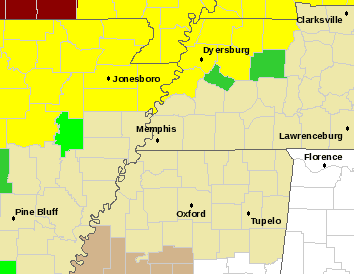 As you can tell on the following maps, a TORNADO WATCH (#761) has been issued for portions of West Tennessee. While this watch isn't for our immediate area, the potential exists on Friday for strong afternoon and evening thunderstorms. These storms could be accompanied with strong wind gusts, large and damaging hail, and frequent lightning strikes. Our friend, Davis Nolan (at NEWS 2 and NashvilleWX.com), has an interesting post about severe weather potential for Friday and Friday night at their weather blog.